It’s a fountain pen. No, wait. It’s a dip pen. Hang on a minute. Ah, nuts! It’s both. By now many people will have heard of or seen the Desiderata Daedalus, conceived of and brought into existence by Mr. Pierre Miller of The Desiderata Pen Co., Chicago, Illinois. The pen is a hybrid. It is essentially a fountain pen sporting a dip nib. In this case the nib is the Comic Zebra G, much favoured by manga artists and a solid performer – which we will come to in due course. In the early history of this one-man company there were many and varied models made from a number of interesting and exotic woods, and even a part acrylic version. Sadly, for most of us, and for one reason or another, these wood versions are no longer available. We can only hope they may re-emerge later. What we have left is a pen made from Delrin. This is a versatile plastic that is used in a wide range of applications, from precision engineering components to furniture parts and much else. Perhaps most people will be familiar with it in its use in knife handles. Anyway, the Delrin here is cool, smooth and very, very black. The shape of the pen is in the guise of a three stepped telescoping rod. In fact, on the day it arrived at work a colleague asked if it was a pocket tool – which it is, only not quite what they expected! The reason for the small step toward the end of the barrel is to accommodate the cap if one should wish to post it. Frankly speaking the pen does benefit from being posted, in terms of its perceived weight and balance, but naturally this will be a personal choice. 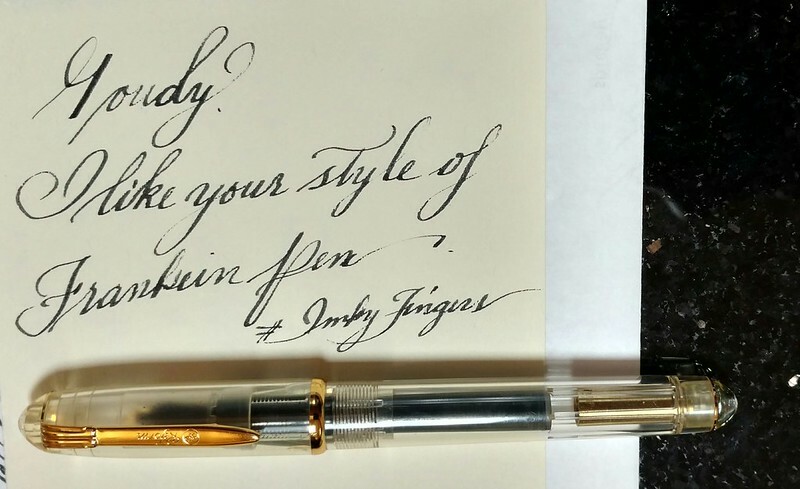 The ends of the barrel and cap have some neat chamfering, and overall the pen is well-turned. There are some turning marks on it, though they seem quite in keeping with its industrial demeanour. Barrel (main) diameter is 11 mm, section is 10 mm. The pen is an eyedropper. Open that sucker up and slop your favourite writing juices in there! I haven't measured this yet but at a guess I would say the barrel takes between 2 and 3 ml of ink. The main draw here, and the raison d’etre for the pen’s existence, is the nib. This is a pen that offers the full flexibility of a steel (or titanium) dip pen, but without the very high price tag that often accompanies vintage pens with gold nibs. And that is exactly what it does. Familiarity with dip pens is useful, though this is also an excellent tool for those who are new to this sort of thing. The nib is sharp, flexible and, unlike a lot of dip nibs, quite user friendly. In other words, it will take a reasonable amount of abuse from the ham-fisted among us (author included). So, to shamelessly borrow from Dr. SBRE Brown, what do I like and what do I not like? Price – well under $100, makes this a most affordable alternative to vintage flex pens. Durability – the Delrin looks like it would survive the apocalypse. Nib – the zebra G is a first rate entry into flexible dip pens. It is also quite cheap to buy and easily available from all the usual sources. Machining – good finishing and precision threading give lots of confidence. Feed – hand cut ebonite feed that serves the nib well. Size - it’s a thin pen. A little more girth would be nice. Subjective yes, but noted nonetheless. Delrin – It’s a good functional material, but does not ring my bell for aesthetics. Other material options would be nice to explore. Maintenance – the trade-offs with using a steel dip nib are the need to keep it clean and the understanding that it will wear out and need replacing. Meaning a lot of nib pulling. No roll-stop – some may like the cool and vast expanses of darkness. I am not one of them. The earlier pens had a neat little stop. Pierre, please bring back this option! This is a good fountain pen and a very neat way for those of us on a budget to have a go at writing with a flexible nib. The need to change the nib relatively regularly, and to keep it clean in between changes, can be seen as both good and bad. Good in that it encourages good pen housekeeping habits, bad because it may be a tad annoying to have to do it so often. The pen is certainly different from anything else out there. Pierre has improved the feed from the earlier models and it works very well. I haven’t had any noticeable railroading yet. At this point I have only tried Diamine Teal and ESSRI iron gall ink. Both worked well, but there may be other inks that do not. Discovery is part of the fun, they say! Also worth noting, I tried some frankenpen set-ups using the same nib in Chinese pen bodies. While this worked tolerably well, the feeds on those pens did not work anywhere near as well as the Daedalus. Would I recommend it? Yes, I would, but with the caveat that the pen will not magically make your writing better. It still takes practice and patience. Will I keep mine? Debatable. I like using an oblique dip pen holder for this kind of writing. And yet the Daedalus is certainly a lot of fun. Time will tell. Disclaimer: this review represents my personal opinion. The pen was purchased at full price by me. Did it railroad easily ??? It feels very smooth and cold. Not really like ebonite at all - EoC much prefers ebonite. As for railroading, nothing much yet. The nib is a slightly hard starter if it has been sitting for a day - it is in a pen cup with the nib upward. I think the Zebra "Titanium" nibs are not actually made of titanium. Maybe coated in titanium, or maybe just a name, but I'm pretty sure they are still made of steel. I am not aware of dip nibs entirely made of titanium, as it seems it would be too expensive for their function. I wouldn't know, I didn't get a titanium nib with this pen, just the steel version - which I am already familiar with from my adventures in dip pens. Really cool review! I was lucky to get one when Pierre first offered it for sale on Etsy. It was supposed to a wood pen but the wood ones had some flaws so Pierre sent me a green ripple ebonite pen AND a black Delrin pen. Fantastic pens. I haven't got to try out the new titanium-coated Zebra G nibs yet. Also, my pens have (what I think) are PVC sacs inside them. The Delrin one has a hole at the end of the barrel, I think to be used a blow-filler but I've not tried it. I'm going to have to ask Pierre if the ripple ebonite pen can be used as an eyedropper. Thanks for the review! Your handwriting is beautiful. Edited by rpsyed, 13 January 2016 - 09:11. I have one of the prototypes that Pierre was having people beta test for him a couple of years ago. It was supposed to be a blow filler, but I couldn't get it to fill, so I used mine as a eyedropper. Makes one wonder if tipping can be added to a dip nib, but that would still not get around the problem of corrosion on the rest of the nib, so probably wouldn't be cost effective. Hooray, you finally got one! I have a buyer for all of my vintage gold dip pens, so this is out of the question for me now. And besides which, it is uncertain if I will keep the Desiderata. At this moment I am of the opinion that it will be going. OTOH, maybe not -- one of the things I *didn't* like about the prototype was that I couldn't post the cap. Cap posts amazingly securely on the new model. Time to upgrade perhaps? Excellent review ~ thank-you for this. The Zebra G, which this pen was designed around, is a Japanese illustration nib for manga artists. That's pretty much a dead give away for what kind of paper you should be using and it's raison d'être. I was also under the perhaps misguided assumption that this pen was created to give the artist the 'dip nib' experience without having to dip as often. Instead of a fountain pen sporting a dip nib, I see it as a dip nib with a fountain pen's convenience. You can get into your drawing zone and go and go and go, without having to break to reload your nib every 30 seconds. The one thing that drives me a bit bonkers is that the barrel is too smooth. I have no grip whatsoever when using this pen...currently I'm using tiny hair elastics on the barrel to provide traction and will be picking up some rubber thimbles to wear when working with it. That is my singular complaint with the Daedalus. I'll probably try out some other nibs on it for fun, but in the end it does the job I purchased it for. Edited by Pira, 14 January 2016 - 23:46. If I had easy access to other nibs I would try them out in this pen, but I don't so I can do nothing except watch what others are doing. If I was certain that a Waterman #2 nib would fit then I could look around for badly damaged pens with a salvageable nib. Regarding the smoothness, yes it is rather smooth. I haven't found it to be a problem when writing though. An inelegant suggestion would be to put a cloth-based sticking plaster around it. Won't look great but it would give grip! I think it has always been marketed mostly as a way to try "true" flex writing without having to shell the money (and bear the uncertainty) for vintage. At least, this is all I saw about it in the last year or so, since I became aware of the existence of such pens. Like I said....I knew nothing of it until a number of artists recommended it to me because from their experience it was nothing short of a miracle. The seeming obsession with flex amongst fountain pen users would explain why it came into existence initially. Us little ole drawers are just enjoying the side benefits of it being a amazing tool for illustrating. As for a cloth plaster; problem would be the residue from it and closing the cap with the bandage on. My little lady hands with fingerprints worn smooth over time and damaged wrists makes it difficult to maintain any control.....I think a rubber thimble will do the trick for the time being. If you were 100% certain that the pen is only a tool and you will never sell it... I guess you could rough up the surface of the section with some coarse sandpaper. ...I have considered that. The idea makes me cringe a bit though. I still think that the simple solution will just be a little rubber finger tip like they sell in stationary supply shops and use in post offices. Delrin is the slipperiest pen material I've encountered - an odd choice for a grip section. The earlier Desideratas had a slight convex curve to the section which helps to keep your fingers from sliding down. One other small niggle is that the cap of this latest model has a fairly sharp edge to it, which scratches against my hand when I'm writing with the cap posted. I ended up taking some micro mesh and smoothing the edge down.